St. Bernadette Parish began as a mission of St. Dominic Parish in 1956. Over the years St. Bernadette Parish has flourished into a vibrant faith community on Panama City Beach with 925+ registered families and 250+ winter parishioners. We offer many vital ministries that support our parish family and community of Panama City Beach. The Child Development Academy is a Florida Department of Children & Families certified child care facility, offering care for children ages 6 weeks-5 years. The hours of operation are Monday- Friday, 7:00am - 5:30pm. For more information on our Academy, please click the link below to visit the website, call us at 850-230-0009, or email us at info@stbcda.com. EDGE Catholic Middle School Ministry uses storytelling, small group discussions, creative projects, music, and prayer to bring our Catholic faith alive. It is fun, engaging, age appropriate, and follows a three year rotating curriculum based on the guidelines set forth by the U.S. Conference of Catholic Bishops. EDGE meets on Wednesdays 6:00 pm - 7:30 pm in Catholic Center room 9.
will challenge teens intellectually and spiritually. LIFETEEN meets on Wednesdays 7:30pm - 9:00 pm in Catholic Center room 10. Mrs. Yvette Valenti is our Youth Director and can be contacted at 850 249-1201. The Diocese of Pensacola-Tallahassee is committed to healing the hurting hearts of sexual abuse victims. The diocese has established Victim Assistance Coordinators who are experienced and trained counselors. These coordinators are available to help persons who have been sexually abused by a priest, deacon, or other church personnel. 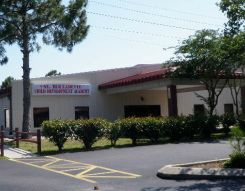 John Lee Outreach Center is a thrift shop providing clothing and household items to the Panama City Beach community. We work with Beach Care Services to provide items to families in need at no cost. Proceeds from the Outreach Center benefit Catholic Charities, Beach Care Services, St. Bernadette Child Development Academy, and St. Bernadette Youth Ministry. Volunteers and donations are always welcome. Donations can be dropped off at the center during regular business hours. If you have a donation that needs to be picked up, you can contact us at the Church office 850-234-3266. Two buildings south of St. Bernadette Church on Moylan Rd.